There is no mention of a church in Domesday Book, though the village appears to have been profitable and, unusually, shows an increase in value after the Conquest. Of the various landholders recorded, one is Hugh, a nephew of Herbert who was the Bishop of Bayeux’s man. 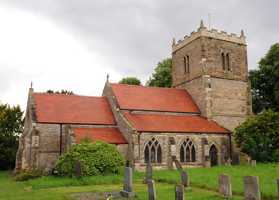 The church comprises a nave with north and south aisles and south porch, chancel with north vestry, and west tower. The nave and aisles date principally from the 13th century, although earlier work is indicated by the 12th century font, decorated by blank, interlaced arches, and the eastern respond of the south arcade which may also be of the late 12th Century. A piscina at the east end of the south aisle has foliate decoration. The chancel is largely of the early 13th century but with a later east wall. The west tower appears to be of the 15th century, perhaps with some later alterations. There were major restorations in 1881 (chancel) and 1884 (nave). In the base of the tower, but originally in the chancel, is a fine monument of 1583 to Sir Richard Whalley, his three wives, and twenty-five children. Elsewhere there are also monuments of the 12th and 14th Centuries and a small amount of pre-Conquest sculpture. There is a Royal Coat-of-Arms dated 1684 (Charles II). In the churchyard are some good examples of slate grave markers, one with masonic emblems by Wood of Bingham dated 1819. There are three bells housed in an unusually large wooden bellframe, Elphick Type ‘V’, and probably contemporary with the 1639 bell. The bells are of three periods: c1472-1508 by the Mellours family, 1639 by George Oldfield I, and blank but apparently of the 18th century. The ladder from the silence chamber to the belfry appears to be late medieval in date. In the corner of the churchyard, at the east end, is a small house (now a private residence) dating from the 16th or 17th century which may once, speculatively, have been a priest’s house.